The Last Child by John Hart (Minotaur Books) was the winner. It tells the story of the abduction of a twelve year old girl and the attempts by her twin brother and a police detective to find the culprit, after a second child has been kidnapped. A lot of deadly secrets are uncovered in the town. In the Shadow of Gotham by Stefanie Pintoff (Minotaur Books) won in this category. A former New York City policeman investigates the murder of a brilliant Columbia mathematics graduate student. A student of criminology tries to take over the investigation, saying he knows who the culprit is. The novel is set in the early 1900s. Body Blows: A Joe Grundy Mystery (Castle Street Mysteries) by Marc Strange (Dundurn Press - Castle Street Mysteries) is the winner. The Lineup: The World's Greatest Crime Writers Tell the Inside Story of Their Greatest Detectives , edited by Otto Penzler (Little, Brown and Company) won in this category. The Lineup: The World's Greatest Crime Writers Tell the Inside Story of Their Greatest Detectives is a book I'd love to read. Burying The Bones: Pearl Buck in China (Import) by Hilary Spurling printed by Profile Boooks, Ltd. in England, 2010. "This is a thrilling portrait of the extraordinary childhood of Pearl Buck, the now-forgotten bestselling Nobel Prize winning novelist. Pearl Buck was raised in China by her American parents, Presbyterian missionaries from Virginia. Blonde and blue-eyed she looked startlingly foreign, but felt as at home as her Chinese companions. She ran free on the grave-littered grasslands behind her house, often stumbling across the tiny bones of baby girls who had been suffocated at birth. Buck's father was a terrifying figure, with a maniacal zeal for religious conversion - a passion rarely shared by the local communities he targeted. He drained the family's budget for his Chinese translation of the New Testament, while his aggrieved, long-suffering wife did her utmost to create a homely environment for her children, several of whom died tragically young. Pearl Buck would eventually rise to eminence in America as a bestselling author, but in this startlingly original biography, Spurling recounts with elegance and great insight her unspeakable upbringing in a China that was virtually unknown to the West." A review of this new book describes it as a "creative biography" of author Pearl S. Buck. The review is by Elaine Showalter in the Literary Times: Review of Burying the Bones, a biography. Anchee Min's book, Pearl of China: A Novel is a fictional account of Pearl Buck's growing up in China and her friendship with a Chinese girl her age, Spurling's book is a biography, but both books describe the turbulent times in China in which Pearl Buck grew up. Here is my review of Pearl of China. 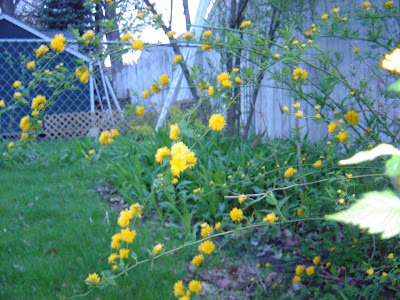 Not a forsythia, but blooms early spring. Double yellow flowers on long narrow green stems. Anyone recognize this? Teaser Tuesdays, hosted by MizB, asks you to choose two sentences at random from your current read. Include the author and title for readers. "You stole my father's wallet!" Pearl yelled. No, I didn't." I imagined the food the money in the wallet could buy. (ch. 2) . Publisher's description: "In the small southern China town of Chin-kiang, in the last days of the nineteenth century, two young girls bump heads and become thick as thieves. Willow is the only child of a destitute family. Pearl is the headstrong daugher of zealous Christian missionaries. 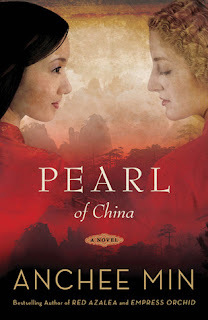 She will grow up to become Pearl S. Buck, the Nobel Prize-winning writer and activist, but for now she is just a girl embarrassed by her blond hair and enchanted by her new Chinese friend....Pearl of China celebrates an incredible friendship and brings new color to the life of Pearl S. Buck, a woman whose unwavering love for the country of her youth eventually led her to be hailed as a national heroine in China." About the author: Anchee Min was born in China in 1957 and endured the Cultural Revolution. She was sent to a labor camp, was recruited there by Madame Mao's talent scouts to be come an actress in propaganda films. She moved to the U.S. in 1984. Her first book is the memoir, Red Azalea , which became an international bestseller. I've read Pearl Buck's The Good Earth and am really interested in the novel about her childhood in China, especially the history of the turbulent period of the time. The cover, the title, and the information on the book jacket caught my attention at the library. Author Anchee Min's memoir, Red Azalea, is also on my TBR list.